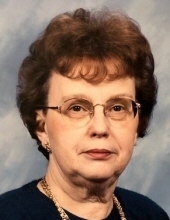 Anna E. Ray passed away at her home surrounded by her loving family on Sunday, April 14, 2019 at the age of 83 years. Anna Erlene was born on January 27, 1936 in Melber, Kentucky; a daughter of S.D. and Mayme (nee Whittemore) Austin. She was a 1954 graduate of Cass Tech High School in Detroit. On November 17, 1956, Anna married James Robert Ray at Grace Baptist Church in Warren. She continued her education at Wayne State University and achieved her BSN in 1958. Anna had a very caring nature and her profession in nursing and teaching showed this trait. She continued to care for people even while she was managing her own health issues. Anna was blessed with the gift of playing the piano and organ and used her talent to play in church for many years. She enjoyed going to lunch with family and friends, attending church and filling her calendar with social events to attend. Anna was a kind hearted and loving person. She will be greatly missed by her family and all who had the honor of knowing her. Anna is survived by her children, Karen (Michael) Price, Kenneth (Becky) Ray, Rebecca (Ron) Thompson and Beverly (Timothy) Summers; grandchildren, James Price, Ashley (Joe) Marchese, Elizabeth (James) Richter, Cameron Nyhoff, Austin (Deanna) Ray, Mitchell Nyhoff, Joshua Price, Jordan Ray, Lindsay Ray, Brianna Price, Bethany Price and Kara Thompson; great-grandchildren, Ethan Richter and Elaina Ray; and sister, Clara Eulaine Hachen. Anna is predeceased by her husband, James and parents. Visitation will be held Friday, April 19, 2019 from 2:00 p.m. to 9:00 p.m. at Hauss-Modetz Funeral Home, 47477 Romeo Plank, Macomb, MI 48044. The Funeral Service will take place at 11:00 a.m. with a 10:00 a.m. instate time on Saturday, April 20, 2019 at Shelby Bible Church, 47905 Hayes Road, Shelby Township. Burial will take place at White Chapel Cemetery on Saturday at 2:15 p.m.
Memorial tributes would be appreciated to the M.S. Society. "Email Address" would like to share the life celebration of Anna Erlene Ray. Click on the "link" to go to share a favorite memory or leave a condolence message for the family.